Just a list of projects I might want to do in the future. This project was created on 06/08/2015 and last updated 2 months ago. 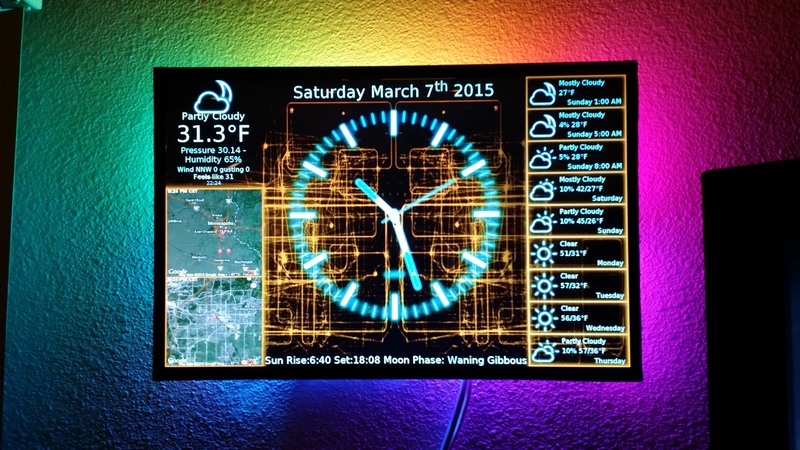 The PiClock is a clock (duh), weather forcast, and radar map display based on the Raspberry Pi and a display monitor. The display monitor is assumed to be an HDMI monitor, but it will probably (possibly) work with the composite output as well, but this is not a design goal. The main program (Clock/PyQtPiClock.py) will also run on Windows, Mac, and Linux, as long as python 2.7+ and PyQt4 is installed. The Weather data comes from DarkSky using their API ( https://darksky.net/dev/ ). The maps are from Mapbox ( https://mapbox.com ) or Google Maps. 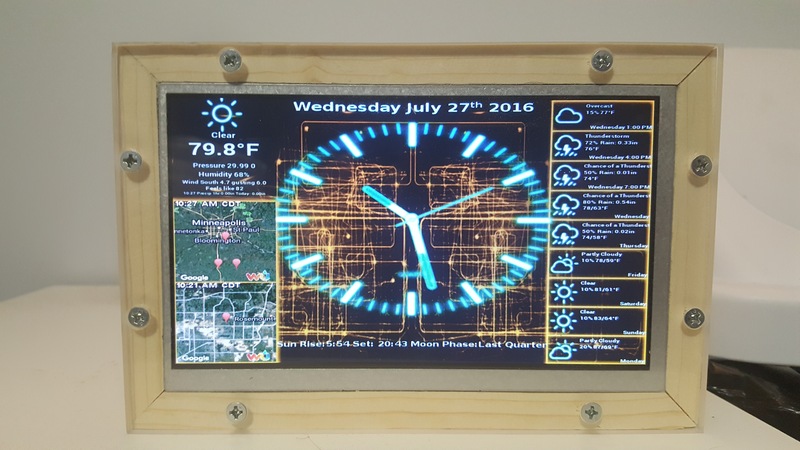 The PiClock is a clock (duh), weather forcast, and radar map display based on the Raspberry Pi and a display monitor. The display monitor is assumed to be an HDMI monitor, but it will probably (possibly) work with the composite output as well, but this is not a design goal. The main program (Clock/PyQtPiClock.py) will also run on Windows, Mac, and Linux, as long as python 2.7+ and PyQt4 is installed. The Weather data comes from DarkSky using their API ( http://darksky.net/dev/ ). The maps are from Google Maps API. You must get API Keys from DarkSky and Google in order to make this work. It is free for low usage such as this application. The power usage I&apos;ve measured is about 35watts with a 19" HDMI Monitor, 27 LEDs and the Pi. The LEDs contributed 3 or so watts, and I think the Pi is about 2-3 Watts normally. I chose to remove the plastic frame from my monitor and mount the Pi directly on it, as well as tap power from the display&apos;s power supply. I&apos;ve made it work on multiple platforms and form factors. And I&apos;ve made some for friends and family with different customizations. PiClocks have been successfully built and proudly displayed around the world by many people. Some examples can be seen on closed github issues, as well as my public facebook page. I can&apos;t tell how many PiClocks are out there. The github page shows 123 forks and 395 stars. Here on Hackaday.io, there are almost 273 skulls (likes) 158,000 views and over 2,000 followers. As well as 189 comments in the form of questions and answers. I try to answer questions mostly on github. I&apos;ve made several PiClocks for friends and family. A few friends have made their own as well. Maybe you&apos;d like to give it a try. 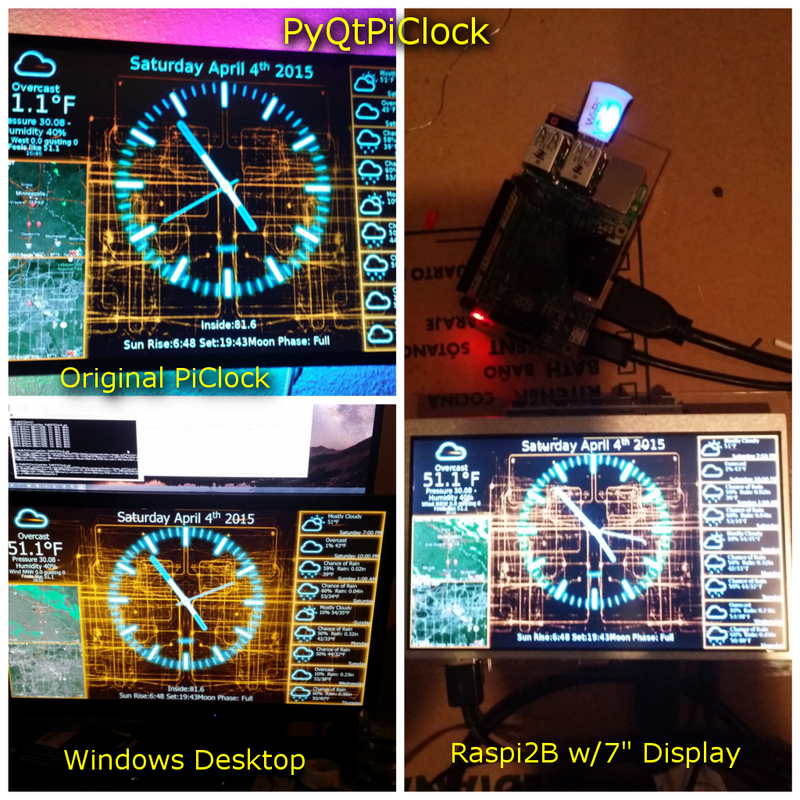 Here are some successful PiClock build pictures. 1 × 5V Power Supply (for Pi) Power Supply (or if you&apos;re ambitious tap your display power supply, you&apos;ll probably need a switching down regulator to 5v) Remember the Pi likes something that can source up to 2A. Install instructions have been redone for Raspbian Stretch. In addition NeoAmbi.py (Neopixel ambilights) have been updated to use rpi-281x/rpi-281x-python. This removes a dependency on an outdated boost library. Mapbox.com maps api can now be used instead of Google Maps. The Instructions have been updated to reflect this. As many of you know the WeatherUnderground API is being phased out as of December 31, 2018. The master branch for PiClock has been updated to replace WU with DarkSky for the forecast data, and RainView for the radar images. Please post issues at github https://github.com/n0bel/PiClock/issues It is much simpler to manage issues there, as well as help the community of PiClock users active there. A small but great discussion is still going on about #PiClock, and its future direction. https://github.com/n0bel/PiClock/issues/54 Add your input! Since then, @neo-aeon read my comments and created a great (read as GREAT!) tool for helping to create new clock face and hand images. He&apos;s also created a great clock face. Both of those are in the https://github.com/n0bel/PiClock/tree/master/Contributed folder. Thanks to all current and future contributors! I just fixed a bug where the time was not changing on the second page. fter introducing some dimming features to the PiClock last week, and including a dimmer configuration example, I was asked if the dim config could be swapped out at night, and then back again during the day. Well it didn&apos;t seem too tough a challenge, so the PiClock now includes swapper.sh, which is meant to be run from cron. It restarts the main python script with a config that you specify. So my bedside piclock now switches between day and night modes. Previously it was continuously dimmed. Of course the project is on GitHub ( https://github.com/n0bel/PiClock ) and switcher.sh has been added. The Install instructions have been updated. The PiClock in its basic configuration is a Raspberry Pi, and an HDMI Monitor (and power and SD card of course, and possibly a WiFI dongle). This project has a number of optional items. You could proceed through these instructions without any of these hardware extras, and then add them later. I&apos;d suggest you read through that first if you&apos;re considering adding these options. 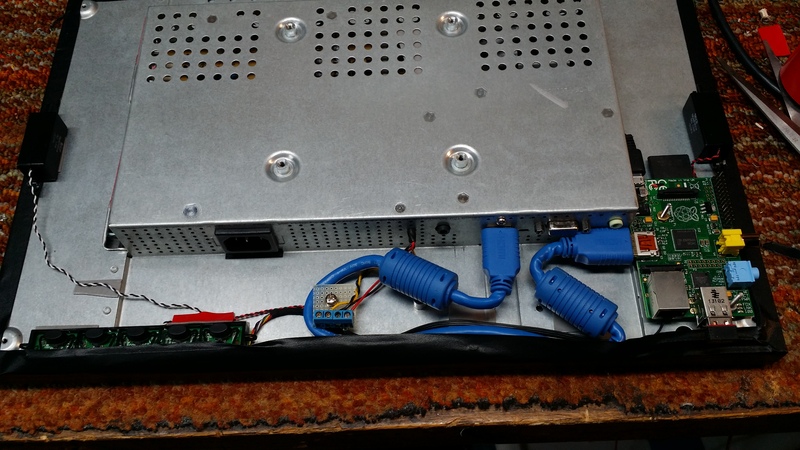 Begin by setting up your HDMI Monitor, Raspberry Pi, and power supply. Some kind of keyboard and mouse will also be handy, connected via USB. I&apos;m assuming most everyone can get this far on their own. If you&apos;re going to do those hardware extras, mentioned in the prior instruction, put them together as well. "Raspbian Stretch with desktop" It will work with many raspbian versions, but you may have to add more packages, etc. That exercise is left for the reader. What follows is a step by step guide. If you start with a new clean raspbian image, it should just work. I&apos;m assuming that you already know how to hook up your Raspi, monitor, and keyboard/mouse. If not, please do a web search regarding setting up the basic hardware for your Raspi. Is it possible to add the weather radar imagery to radar2 and radar4? I have these centered differently and a tighter zoom but hoping to see the radar images at this level as well. Also is there any way to change the opacity of the rainfall so that the map below is still visible? I have VERY limited coding skills but managed to tweak several settings (time format to 24hr vs 12 hr, removing the year from the date display and adding a second location and secondary coordinates to call when needed). I am eventually hoping to add the third frame to call on another api for use as a status board at my fire station. 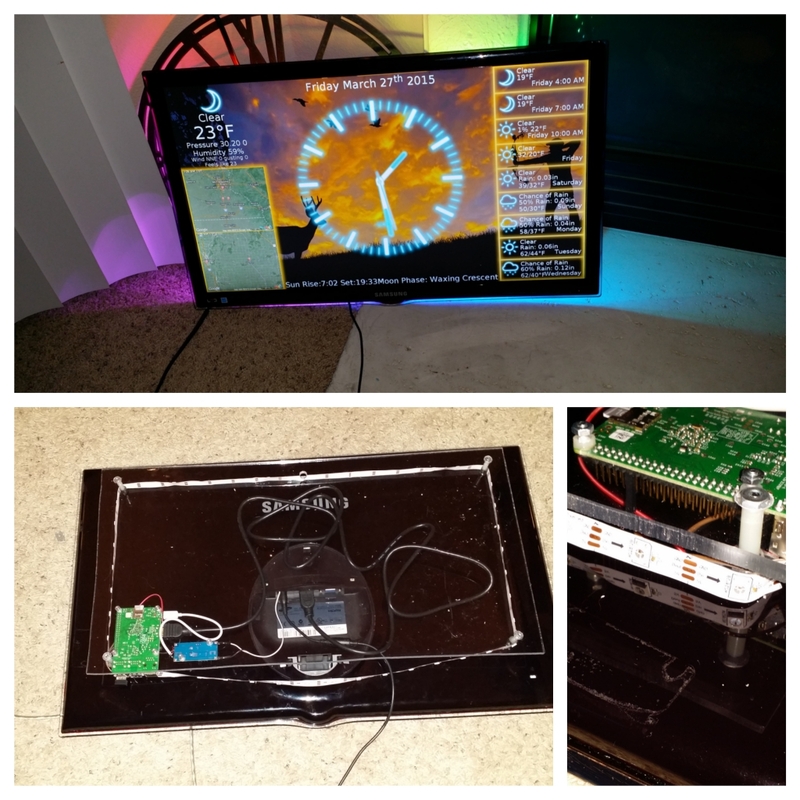 Just completed my build on a Pi 7 inch screen and it works great. Been trying to find out how to change the temperature reading to Celcius. Saw a post saying to do an update which I have just done but Im still getting F instead of C, any pointers? Not using external censors just the DarkSky API. Wunderground going away as of 2019. Anyone using NOAA data? Google Maps grey: Google now requires an API Key to work. It looks like Weather Underground is going away end of year 2018. Have you looked at darksky api. All kinds of good data. Weather alerts would be a good addition to the interface. If there is a advisory, watch, or warning you are interested in, you could display it over the bottom part of the screen under the clock. Would it be an option to go to google maps with the coordinates of your location, take a screen capture and edit for you desired image? Then use the image instead of the url call. Google Maps was the problem for my gray screen. I just went a head and counted the hits on the google api and it only hit 2 times in 2 days it shouldn&apos;t hit anymore unless I reboot it once it pulls the maps it doesn&apos;t hit it anymore. So I went a head and attached a payment account to it. They charge you $2.00 per 1,000 hits a month. I&apos;ll never hit that. Now my radar is back up and running. So I&apos;m good until someone figures out something else. I just love this PiClock and it runs 24/7. Living in Florida it&apos;s very very useful with all the storms we get. Same problem. The Google map comes thru as a gray panel but the radar overlay is fine. Started happening about a week ago. A reboot or two seems to fix it. Rick, Have the same problem... Got the radar.. No map. Will troubleshoot... maybe tonight? Edit: I noticed in the bottom right corner shows a WU icon.. Never saw those before. Anyone know how to fix the Maps not showing up anymore? I have no Google API keys only key is the WU Key in the ApiKeys.py. Radar works fine just no maps. Hi! I&apos;ve been testing this app for a few days for my school project, and it&apos;s really really nice. Do you think it&apos;s possible to add a news feed or some kinda new widget in PiClock? For example replacing a few squares of predictions to add something there. This is a great app. I have just started using in and really enjoy it. I was wondering if you have any intention to make the screen touch sensitive. I am using it on the raspberry Pi 7" touch screen and would like to mount it on the wall and do away with the keyboard. Thanks for all your work. I am curious is there a way to import traffic on the google maps? Anyone having issues with Maps showing up? The Radar works, but google maps no longer showing. Just started doing it. Not sure where to start. Hi, I just got done today and what I am seeing is a Gray background with specks here and there on a loop but no map details with WU int he right hand lower corner. I also tried the example configs and they do the same thing. I just found that if I remove the google API key from the APIKeys.py that everything works now. Hi Kevin, This is really great project with time, weather and radar precision...thanks for detailed instruction and I made it work exactly what shown here. It is working also at boot up but just have a question if you could guide me how to run this PiClock at given interval. I have some other slideshows which I would like to run on-screen with PiClock at certain interval concurrently running by switching from piclock to slideshow and vice-versa. I am trying to make an interactive display with time interval showing both slideshow and PiClock. Thanks a lot and appreciate your help. I have the import error: no module named apikeys when I tried to run it, any help please? Hi Kevin, great project, worked very well for me! I want to show the conditions and time for a different location (and different time zone). The location is easy to configure with the relevant location in Config.py, but I don&apos;t want to have to set my system clock for the different zone to display the time there. How do I show the time in another zone? Over the last 3 days our Piclock has suddenly started exceeding the number of allowed calls for my WU API key. We&apos;ve regenerated the key and the problem still exists. Any suggestions? 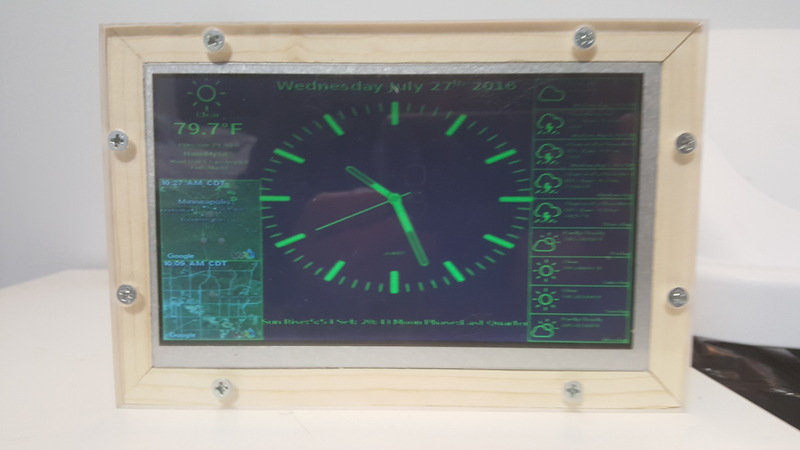 You are about to report the project "PiClock - A Raspberry Pi Clock & Weather Display", please tell us the reason.